10 Years, 36,000 biscuits, and 2,000 lbs. 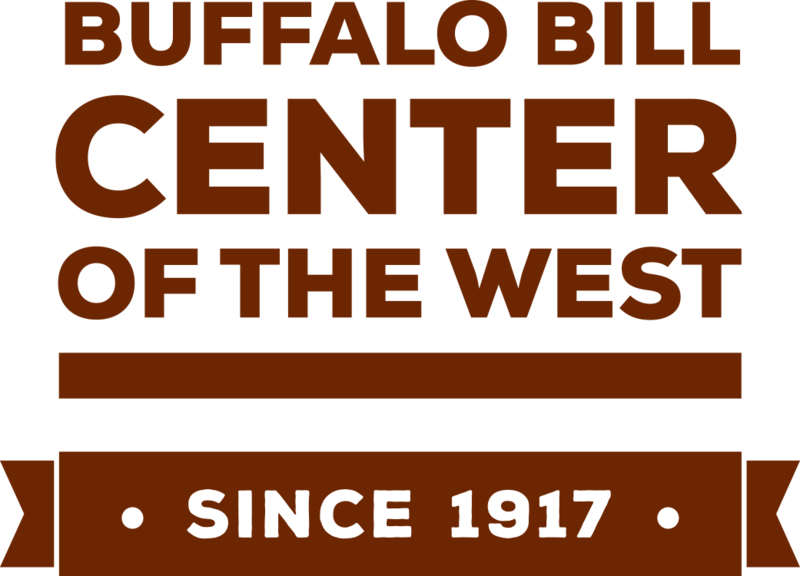 of beans later Buffalo Bill Center of the West celebrates the 10th anniversary of Ron Reed and The Chuckwagon Experience. 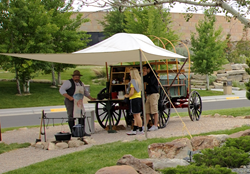 This wonderful cowboy cook and his authentic chuckwagon greet visitors in front of the Center of the West. It was better to be a bad cook than a skimpy cook on the trail. 10 Years, 36,000 biscuits, and 2,000 lbs. of beans later Ron Reed is still bringing us the authentic Chuckwagon Experience! Walking up the steps of the Center of the West you might notice the bittersweet smell of a campfire. A lazy curl of smoke drifts into the afternoon sky. As you drove in you noticed the wagon sitting there with the tipis and the real live cowboy telling stories to other guests. The sights of the wagon and Cookie are just the same as you would have seen them out on the range in the early 1900s. The smell of campfire and coffee would welcome the cowboys home from a hard day’s work and wake them in the morning for another. For Ron Reed, the Chuckwagon is all about the people he has met from all over the world. “I keep track by the number of spoons I’ve handed out through the summer,” he mentioned as I enjoyed his Chuckwagon cooking for myself. It was amazing listening to the stories he could tell about the golden age of cowboys and their Chuckwagons! Can you believe that out on roundups the Cooks would actually race their wagons to get the best lunch and camping spots? 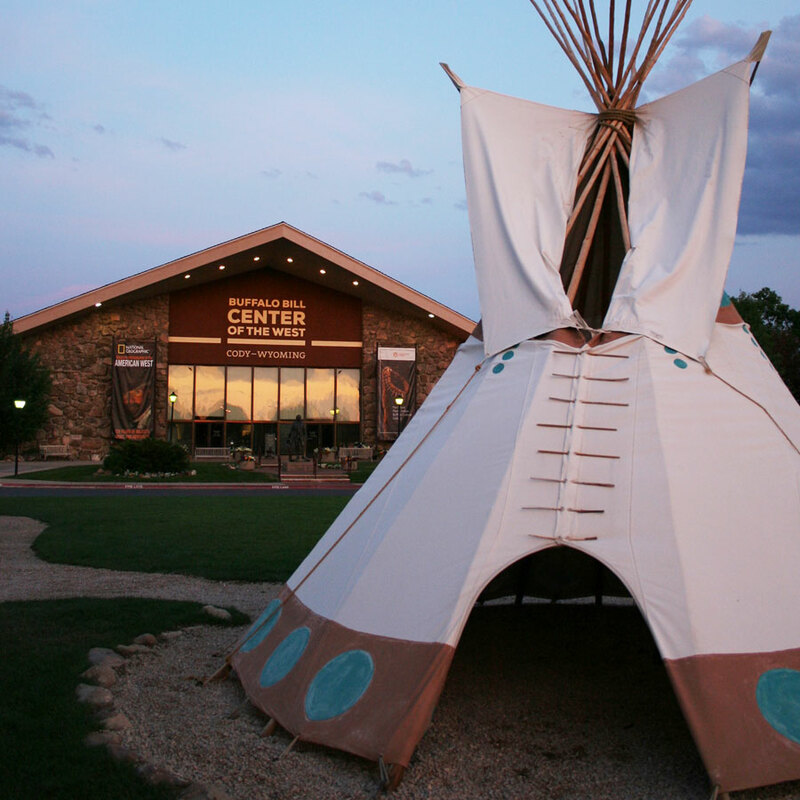 The Center provides you the history, art, natural science, and weaponry of the west but it’s the experiences like the Chuckwagon that transport our guests back in time to the context of those events. You may see a movie scene of cowboys around the fire but you don’t really understand that moment until you walk out the front door and experience that gathering for yourself! There is something so powerful about becoming a part of history by interacting with experiences like the Chuckwagon. It’s no longer something that someone who is dead now participated in a long time ago! It is personal. “Dutch oven cooking is an imperfect science,” Ron explained as he checked the beans again. “Sometimes your biscuits will be done in 20 minutes and the next day the breeze’ll be just right and they’ll take 45 minutes to an hour.” One visitor watched how he placed charcoal on top of the Dutch oven’s lid to give an even layer of heat to the biscuits for baking. She sounded awed as she asked if anything really cooked in there just like an oven at home! A few minutes later she tried a fresh Dutch oven baked biscuit and was delighted to find out just how good they were. Of course, Ron passed on the recipe and some advice about how he would make the biscuits if he was at home. These cast-iron pots known as Dutch ovens are the authentic cowboy cooking tools. You can make biscuits and beans, a really great cobbler, and so much more in them. Cowboys on the trail wouldn’t get too fancy but that doesn’t limit the artistry of cowboy cooks today! We have a few wagons on display here at the Buffalo Bill Center of the West, including a chuckwagon. However, a chuckwagon just doesn’t mean quite as much without its Cookie. Very few of these wagons were ever commercially produced. Usually the Cookie would tell the Ranch boss just what he needed for the wagon and they would design the chuckwagon to fit the cook. In westerns you might notice that the Cookie was an older cowboy with gray or white hair. Ron laughed while telling his guests he feels bad for those white haired men because Cookie wasn’t an old man’s job! Being a Cowboy was a rough job made up of young men from their teens to mid-twenties. The Cookie was usually a retired Cowboy from his thirties to fifties. He was up before everyone else in the morning making breakfast and went to bed late too, after cleaning up dinner. “Cookie could get a bad reputation for two reasons: weak coffee or skimpy cooking. He could be the best cook in the world but if he isn’t fillin’ those cowboys up it won’t matter. 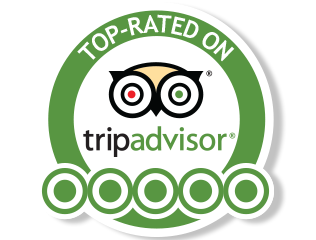 It was better to be a bad cook than a skimpy cook on the trail,” Ron informed our guests. It certainly isn’t a job for everyone! We’re grateful to Ron Reed for his hard work and wonderful contribution for our guests at the Center over the past 10 years. Congratulations Ron, we look forward to many more years of Biscuits & Beans with you around that classic campfire!